At LandTech S.A. we understand the value of our employees, along with the environments in which we live and work in. 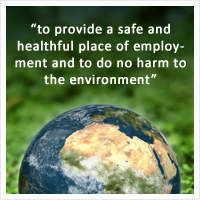 Because of this, LandTech has a very strong commitment to our HSE (Health, Safety and Environmental) program. This program is developed to ensure the Health and Safety of our employees, contractors and visitors. It is also developed to ensure minimal impact of the environments in which work is done. Landtech’s goals for HSE go beyond that of “0 injuries, 0 accidents”. Our goal at Landtech is to take a proactive approach by educating employees, contractors and visitors so that HSE becomes an integral part of life in the work place. At LandTech Enterprises we would like to solicit your feedback in regards to our Environmental, Health & Safety performance. We will address all concerns as quickly and completely as possible. All comments, concerns, or questions on our Environmental performance can be directed to our HSE Manager.